To make some thing with your own hands is not so difficult. The most important is the desire to create and learn new things. For example, to sew a backpack by yourself quite simple. A dense fabric, sewing supplies, accessories, materials for decoration, Velcro (5 cm), eyelets (4pcs), bias binding (2 m), inches (30 cm), a small piece of fabric. First, gather all the necessary materials. It is advisable to choose a dense enough fabric to make the backpack kept the form. 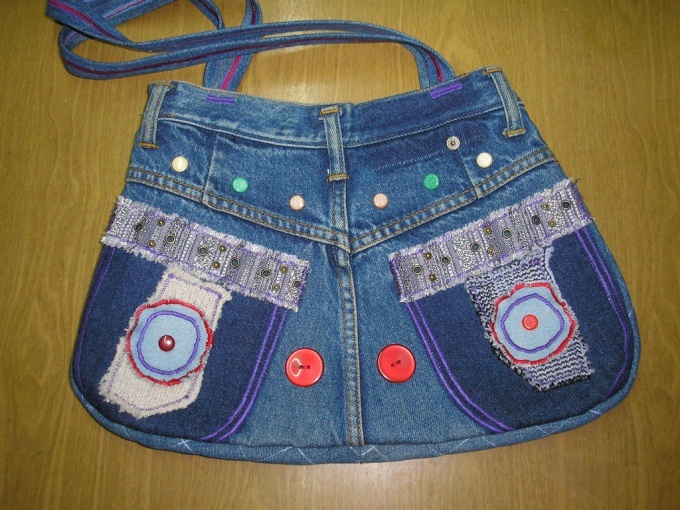 It is possible to sew a backpack, for example, old jeans. Find all the necessary details: oval piece for the bottom (20x12 cm), two rectangular pieces (30x25 cm), pocket square (15x15 cm), two straps (54х4 cm), valve (20x10 cm), a piece for the handle (20х3 cm). Keep in mind that these dimensions of the parts seam is already taken into account. The edges of all cut parts on the serger, or seam "zigzag". Stitch all the details in the following order. Treat bake the edge of the pocket. Sew it on the front side of the rectangle. Next, sew the side seams of the main parts of it, bake the upper section. Also treat with bias binding edges of the valve. Proceed to the straps. With wrong side up fold in the width of the part of straps. Sew them, then turn and iron. Similarly, do and handle. Glue the interlining to the bottom. To the top slice back items backpackand precocity the handle, valve and straps. To the bottom slice of the same part will protocide webbing, and then sew the bottom. The body of the backpackand ready. There was only a small improvement. Punch two eyelets on both sides. Sew the lace. On the front side of the backpackand on the underside of the valve sew the Velcro strip. So here's a simple way you can sew the original backpack its hands, and to give a second life to your old jeans.